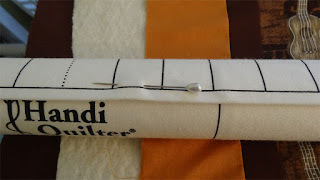 I recently spent some time watching longarm quilting videos on YouTube, just to see what tricks I might pick up. I found a video discussing the problem of keeping the top properly aligned when you are "floating" the top. "Floating" is what I do. It just means the top is laying on the backing/batting - and although it's stitched down across the top (and on the sides as you gradually work your way down), it really would be very easy to accidentally pull it to the left or right as you go along. If that happens, the final quilt won't be blocked correctly, but will lay crooked. The longer the quilt, the more likely you'll get the edges drifting to one side or the other as you work your way down. Well, in this video, the suggestion is to measure the distance from the left and right edges of the quilt to the sides of the longarm frame every time you advance the quilt. I can see how that would work, but.. hm.. it just seems a bit fiddly. I came up with a method that works well without so much fuss. Have a look at the picture below. Here you see a quilt mounted on the frame - and notice the bar (covered in white material) laying across the quilt. That bar is intended to be used to roll the quilt top on it. 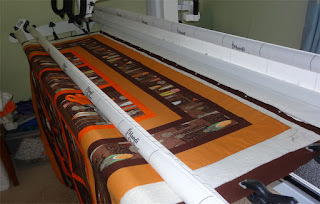 I guess the idea is you mount the top on that bar and roll it out bit by bit as you advance the quilt on the frame. Most likely doing that, you'd avoid the blocking problem and your top wouldn't end up pulled to the left or right. But I like just doing the "float" technique (just laying the top on and not rolling on the bar) - it's faster. My solution to the alignment problem is this: I use the leader cloth on that top bar to mark where the edge is on the quilt when I start. Below shows the leader bar over the left side of my quilt. I stuck a pin into the leader cloth lined up with the left side of the quilt top (the gold fabric). As you can see below, the pin enters the leader cloth right where the left edge is. I did the same thing on the right side of the quilt. Each time I finish a segment of the quilt and advance it on the frame, I just keep an eye on the alignment of the edges with the pin, and if the top has shifted, I gently slide it back into alignment.